SAA soldiers paraded two IS fighter’s bodies through the streets of SAA-held locations in Deir ez-Zor on the trunk of a pickup truck after the two were killed during the IS attacks on SAA in al-Baghiliyah, north of Deir ez-Zor. 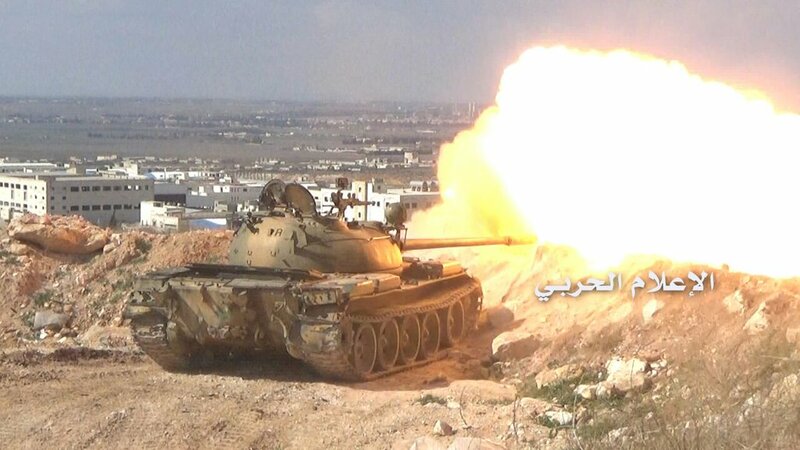 SAA tank firing on IS positions in Kafar Sakeer. Image courtesy of @MilitaryMediaSy. IS launch an attack against SAA forces in Kafar Sakeer, just north of al-Sheikh Najjar Industrial City, in an attempt to advance and reach Aleppo. IS forces manage to advance and briefly take control over the village. Reports of casualties on both sides as control over the village remains contested. Clashes renewed between SAA and opposition forces in the vicinity of Khan Tuman, southwest of Aleppo. 2 individuals were killed by opposition sniper fire in al-Fu’ah. 3 more were injured. Opposition forces clash with IS-affiliated factions in ad-Dumayr. Casualties reported on both sides. SAA targeted IS vehicles in the vicinity of al-Qasr, 35 km north of as-Suwayda, causing some IS casualties. SAA and IS forces clash in the vicinity of Shaer Gas Fields, northwest of Palmyra. Reports of IS advances in the area. Clashes break out between SAA and opposition forces in Talbisah, northern Homs countryside. IS detonate a VBIED on SDF fighters in the southern vicinity of Jabal Abd al-Aziz. Reports of some SDF casualties. Northern Aleppo Governorate: IS vs opposition forces. Reports of IS advances in the area. Nubl – al-Zahraa – al-Tamurah: SAA vs opposition forces. South of ash-Shaddadi – Hasakah Governorate: SDF vs IS. Reports of 4 SDF casualties in the past few days of fighting. 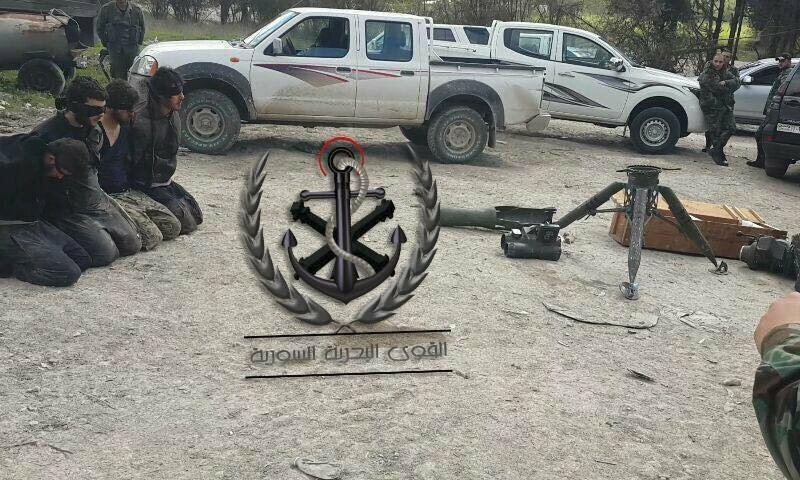 The 4 prisoners and a TOW launcher taken by SAA in Lataia battlefront. Image courtesy of @2Rook14. Kinsabba – Jabal al-Akrad – Jabal Turkman – Latakia Governorate: SAA and allies under Russian supervision vs the 1st and 2nd Coastal Divisions, Ahrar ash-Sham, Ansar ash-Sham, JAN, and Turkestan Islamic Party forces. 4 opposition fighters were taken into SAA custody. Palmyra: SAA vs IS. Reports of one SAA casualty. SAA advances reported. al-Quaryatayn: SAA vs IS. SAA advance in the area. al-Baghiliyah: SAA vs IS. 2 IS casualties reported. Deir ez-Zor Military Airport: SAA vs IS. Reports of one SAA casualty. al-Hawiqah Neighborhood: SAA vs IS. Sorry to see your reports stopped in March, Waha. I know this must take a lot of time to put together every day. Did you quit for good or are you just taking a break? I’m sorry for the unannounced break. It remains to be seen whether or not this break is for good.